Seven Springs, north of Carefree, Maricopa Co., Arizona, 19 July 2015. 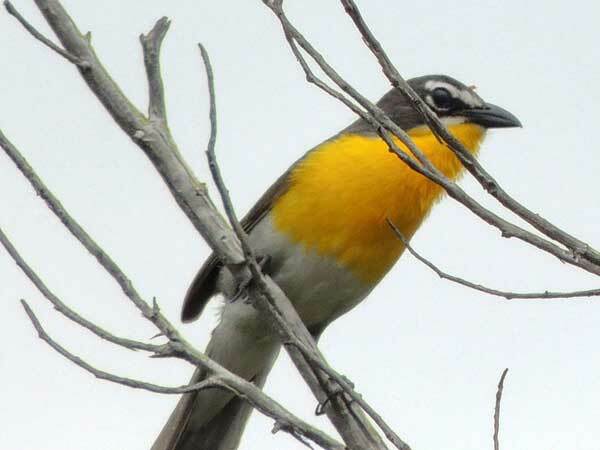 This Neotropical Migrant is widespread acoss North America in the summer but in Arizona it is restricted to riparian zones with cottonwoods, sycamores and willows. With bright colors it can hide surprisingly well in the sunlit canopy where it catches insects. It's noisy call is the reason for the name "Chat". By fall when insects are becoming less abundant this bird flies back to tropical America to spend the winter. Copyright Michael J. Plagens, page created 20 Feb. 2017.